EDIS Review 2019: Is EDIS a Good Hosting? For a number of years, EDIS has been a dominant player in the Austrian web hosting space. The company has data centers distributed across many countries around the world to ensure that their customers are served by data centers within their geographical region for fast, high-performance websites. EDIS is the third largest web hosting solutions provider in Austria by market share. This web hosting vendor also has a significant presence in Germany, the United States, Spain, and China. The company has KVM-virtualized servers for many countries including Austria, Germany, Hong Kong, Japan, the U.K., and the U.S. Their data centers span many countries around the world to ensure that their customers are served by data centers that are close by for fast, high-performance websites. The EDIS website is available in both German and English. At first glance, the EDIS website is a bit cluttered, making it relatively hard to navigate. The website is not user-friendly and it took me a while to figure out where I could get the information I was looking for. What’s more, EDIS does little to explain in detail the features included in their plans, largely just making a long list of these features and with no easy way to compare each of their packages side by side. For this reason, new users might not appreciate the many features EDIS has included in their plans. An advanced user, however, is likely to be excited about these long lists of features, which is perhaps the reason why EDIS is one of the most preferred hosting firms in Austria. EDIS has a range of affordable shared hosting products along with their VPS and dedicated server packages. They include in all their hosting plans one or more email addresses as well as servers that are protected against DDoS attacks. The plans also include up-to-date support for the PHP scripting language as well as the ability and capacity to host all the necessary MySQL databases. I liked the automatic daily backup feature that EDIS includes, which allows users to get previous versions of their websites dating back 30 days. Further, you get beginner-friendly tools such as an app installer and a free .com domain with their Starter Hosting package or better. Unfortunately, most of their packages don’t include a free SSL certificate — only their two highest-tier packages, Platinum Hosting and Platinum Hosting Plus, include a single certificate for free. It’s plain that while they do have a wide variety of shared hosting packages, they may not be the best choice for those just starting out in website building. EDIS uses advanced redundancy protocols powered by state-of-the-art hardware and software that run all year round. These data centers have redundant network and power connections so that they can keep running to ensure that your website stays up and performance optimally every minute of every day. That said, this vendor hasn’t committed to offering an uptime guarantee, something I found quite disconcerting. 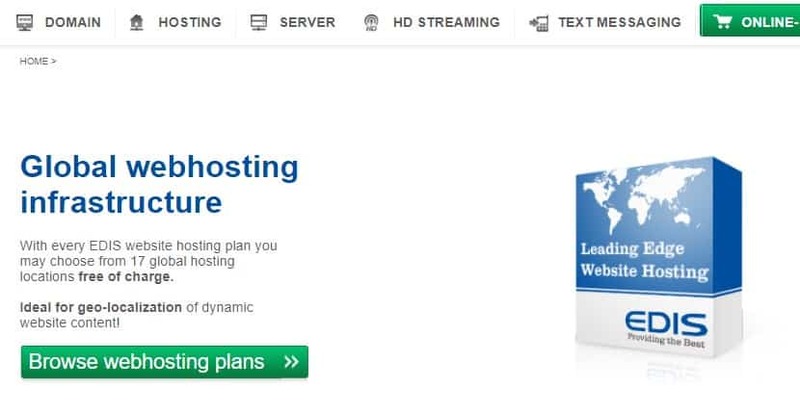 EDIS hosting plans are reasonably priced, with the Starter Hosting option particularly cheap. That said, this starter option might only be appealing to beginners who know very little about web hosting, a group that EDIS doesn’t seem to be targeting as a main focus. Instead, they seem to be catering more to mid-sized businesses or larger with their extensive range of VPS plans. The tech support at EDIS is quite impressive and may be the company’s best selling point. The support team is polite and friendly and has the necessary expertise to resolve your hosting issues quickly. With thousands of customers who attest to their excellent support services, it’s not hard to see why many people would look forward to working with this web hosting service provider. In my experience, the EDIS support team satisfactorily answered the general queries I made about their hosting solutions and referred me to their downloadable manuals on their website for more information. The FAQ section also addressed the most common issues. EDIS has made available several phone numbers and email addresses through which you can contact them: in fact, this is one of their more impressive features, as they have local phone numbers in nine countries around the world. However, their knowledge base is not very comprehensive and their ticket system is only available to their customers. Alternatively, the live chat option is also available, but only during business hours. For users whose biggest concern is a hosting provider with excellent support and a long list of customers to prove it, then EDIS is an excellent choice. With powerful servers located in many countries around the world, EDIS is a powerful vendor with the capacity to host even the most sophisticated websites for businesses anywhere in the world. Wondering how EDIS stacks up against other Web Hosting companies? Enter any other Web Hosting company and we will give you a side-by-side comparison.